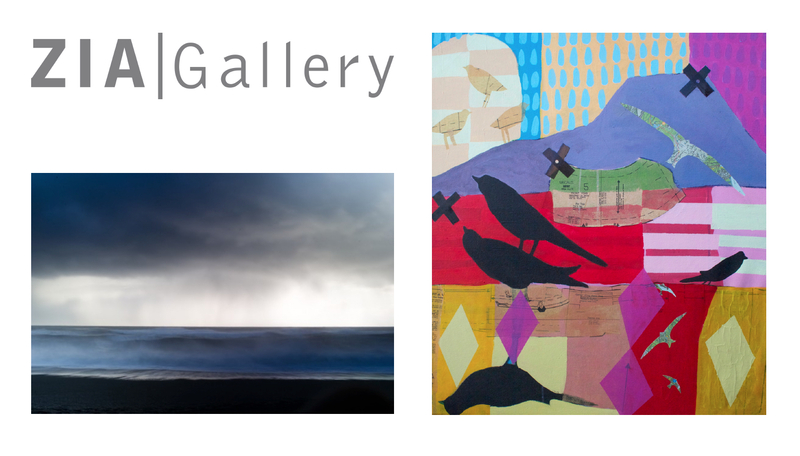 Iceland Inspired, another intriguing exhibition, opened Saturday, March 22 at ZIA Gallery. Artists are finding their way to Iceland and discovering its unique features and fascinating geotectonic geology. Photographer and environmentally aware John Vlahakis and mixed media painter Jonathan Ricci recently spent extended time in Iceland creating considerable bodies of work. Last summer, Ricci turned a two-month artist’s residency in Skagaströnd, Iceland into a productive period developing paintings infused with color, abstract references to land, maps and bird-life. Works conceived from that time is on exhibit at ZIA Gallery. John Vlahakis chose February as the month to compose remarkable images including a number of large-scale photographs. His work elicits frequent expressions of awe. Internationally acclaimed National Geographic photographer Bob Krist and mixed-media painter Anne Hughes serve as bookends to the exhibition, contributing a few special works also developed from time spent in Iceland. The exhibition runs through April 26th, 2014. See how Iceland is influencing artists in Iceland Inspired. Pictured are John Vlahakis’ large scale photograph Surf and Jonathan Ricci’s acrylic and collage on canvas Cold Heat: Purple Mountains-JJ’s Journey. Both artists were in attendance and enjoyed meeting the public. In addition, ZIA was pleased to welcome Icelandic Vice-Consul Einar Steinsson and his wife to the opening.